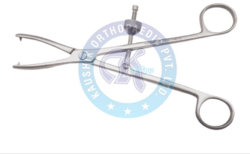 Operating from India, Kaushik Orthopaedic Corporation is engaged in the manufacture and export of orthopaedic implant, bone holding forceps and orthopaedic forceps. We are one of the most reliable organizations in our sphere catering to various hospitals. 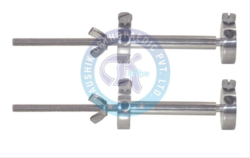 We are among the distinguished names in industry, engaged in manufacturing and exporting a large gamut of Self Centering Bone Holding Forceps. With speed lock, we offer our range in varied sizes that meet individual requirements of the clients. The materials we have used in fabrication of these forceps have been sourced from some of the reliable and authentic vendors of the industry. Backed by a team of immensely skilled and dexterous professionals, we are engaged in manufacturing and exporting Reduction Clamp Serrated. These clamps are offered in varied lengths and sizes that meet each and every need of the clients. Our company is engaged in manufacturing and supplying a wide range of Charnley Compression Clamp by using top class materials and advance technologies. The materials we use are acquired by trusted and legal vendors. Our ranges of instruments are widely known for its main qualities such as rust resistant, durable, and competitive price rates. We offer these instruments at different shapes, designs, and specifications. Under the guidance of our professionals and experts we developed these instruments. 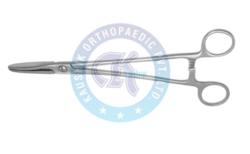 Our esteemed and valued clientele can avail a comprehensive range of Lanes Bone Holding Forceps from us, which are developed as per the industry standards and norms. 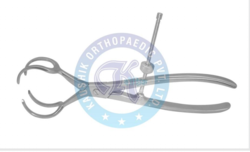 We offer these forceps in different specifications and at most economic rates in market. Clients can avail these forceps with ratchet lock also. Our ultramodern infrastructure and adroit professionals help us in delivering the products within the promise time frame. These forceps are offered in 10", 12", 17 ½" lengths. We have emerged ourselves as leading manufacturer and exporter of Heygroves Bone Holding Forceps. We offer our range in 8', 10', 12' and other lengths as per the specific requirements of the clients. These forceps are used to hold the different types of bones like femur, humerus, and tibia. 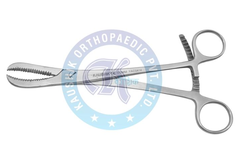 Clients can avail our range of these forceps in different specifications and at most affordable rates in market. Looking for “Bone Holding Forceps and Clamps”?